ASILOMAR, Calif., April 8, 2019 /PRNewswire/ — At the 60th Experimental Nuclear Magnetic Resonance Conference (ENC, www.enc-conference.org ), Bruker announced today a breakthrough in ultra-high field (UHF) high-resolution NMR spectroscopy applied to structural biology and the study of functional intrinsically disordered proteins (IDPs). UHF NMR is complementary to other structural biology methods like X-ray crystallography or cryo-EM by providing structurally-resolved molecular dynamics, as well as functional folding, interactome and drug binding information in solution and at physiological conditions. 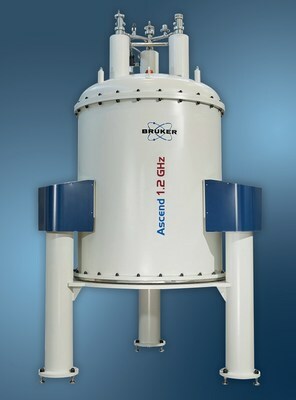 Bruker has successfully energized the world’s first stable and homogeneous standard-bore Ascend 1.1 GHz NMR magnet in late 2018. This magnet has been developed to address the scientific requirements for increased sensitivity and higher resolution in order to study larger proteins, functional disorder, and macromolecular complexes. In recent months, Bruker and some of its key UHF collaborators have demonstrated the power and advantages of this leading-edge technology in a series of high-resolution and solid-state NMR experiments at Bruker’s Swiss GHz-class magnet factory. For many years, high-resolution NMR was limited to a magnetic field of 23.5 Tesla, equivalent to a 1H resonance frequency of 1.0 GHz. This limit was set by the physical properties of metallic, low-temperature superconductors (LTS), and it was first reached in 2009 with an Avance® 1000 spectrometer at the Ultra-High Field NMR Center in Lyon, France. High-temperature superconductors (HTS), first discovered in the 1980s, open the door towards even higher magnetic fields at low temperatures, but considerable challenges in YBCO HTS tape manufacturing and in superconducting magnet technology made further UHF progress daunting until recently. Bruker’s novel high-resolution 1.1 GHz magnet achievement now demonstrates the viability of new LTS-HTS hybrid magnet technologies with enormous technological progress in the areas of HTS materials manufacturing, testing and tape jointing, as well as in UHF magnet stabilization, homogenization, quench protection and force management. Bruker also announced today that it has received an additional purchase order for a 1.2 GHz NMR system from Professors Hartmut Oschkinat and Adam Lange from the Leibniz-Forschungsinstitut for Molecular Pharmacology in Berlin, Germany. Bruker now has received orders for a total of nine 1.2 GHz NMR spectrometers, so far all in Europe.